Save Even More On This Product!! CLICK HERE to activate the coupon, or enter FF in the Coupon Code box at check out. You must use the coupon to get the extra discount. NOTE: NOT AVAILABLE FOR SHIPMENT TO AUSTRALIA, NEW ZEALAND OR SOUTH AFRICA. Natural aid to motion comfort without side-effects. Suggested Usage: Adults take 2 capsules and children take 1 capsule thirty minutes before departure, or as needed, with a glass of water. Can be taken every four hours. As a precaution pregnant women should not take more than 4 capsules in 24 hours. 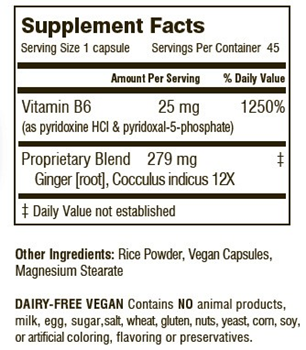 Ingredients: A proprietary formula in small, easy to swallow capsules containing: vitamin B-6, and a proprietary blend of ginger & Cocculus Indicus. Quality and purity: Land, Sea & Air® is a completely natural vegetarian dietary supplement. It is DAIRY-FREE and contains NO animal products, milk, egg, salt, wheat, gluten, yeast, corn, soy, or artificial coloring, flavoring or preservatives. Side effects: The ingredients in Land, Sea & Air® have no known detrimental side effects when used as directed.